Share – This function will let you share your goals or achievements through Facebook and other social media platforms. Today’s Goal – This lists all your goals for the current day. 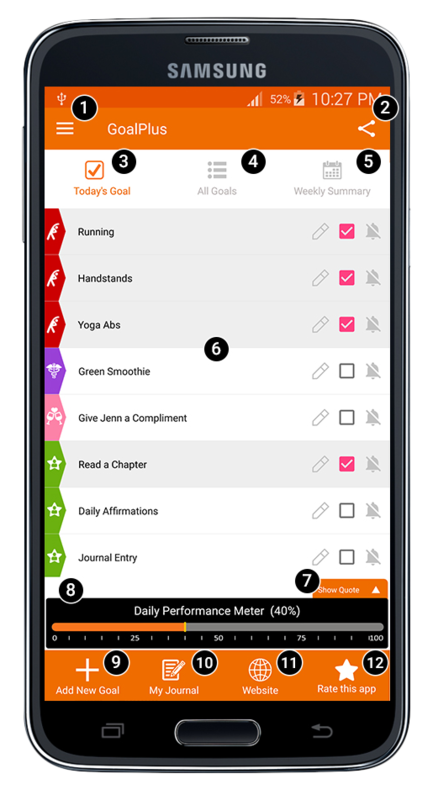 All Goals – This lists all goals you have created within the goal setting app. Weekly Summary – This will display your weekly goal summary or your weekly goal overview to see what day(s) you have missed and how you are procgressing on achieving such goals for the week. 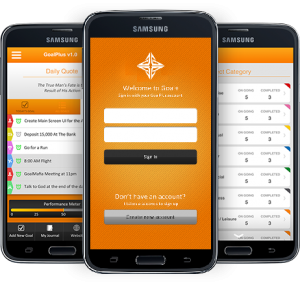 Goal Lists – This will list all your goals in all categories that you have created within the app. a. Goal Category Icon – This is to easily identify the type of goals you have created within the app. c. Edit Icon – This will let you edit your goal settings that you have created within the app. d. Check Icon – This will let you mark your goal(s) as complete. A check mark means the goal has been completed, and unchecked means not completed or ongoing. e. Notification Icon – This will let you identify if you have turned on or off your notification settings when you create a goal. You can also easily turn your notification on and off by tapping this icon right on the home screen. Show/Hide Quote – By default, the quote is being displayed but you can always hide the quotes anytime you want. The quote will change every single day. Daily/Weekly Performance Meter – This function will let you see your daily or weekly performance in percentage. Add New Goal Button – Tap this button to add a goal. My Journal Button – Tap this to add a journal entry and/or view your journal entries. Website Button – Tap this to visit the GoalPlus App website through your mobile device. Rate This App – Tap this to rate the app through Google Playstore.